Meritus Workforce Larger but Less Experienced from 2011 to 2012 - Is Patient Care at Risk? The Maryland Health Services Cost Review Commission makes available wage and salary survey results for all hospitals within Maryland. Since the results include a per-hospital breakout, estimated employee wage/salaries and working hours can be determined by this information. A few interesting statistics emerge when comparing data between 2011 and 2012. Between 2011 and 2012, Meritus made many changes to its workforce. The number of dietitians remained the same. A shift in Meritus' staffing can be observed; from 2011 to 2012, Meritus may have expanded its workforce, but the expanded workforce is less experienced. The decrease in hours worked per employee means Meritus most likely hired more part-time employees, in some cases to replace full time employees. Additionally, Meritus has reduced the number of experienced LPNs, dietary aides, and security officers on staff. All of these changes have the potential to negatively impact patient care, as well as the safety and security of the hospital. With Meritus laying off 60 full time employees, cutting 60 unfilled positions, and reducing the hours of 43 additional employees, will patient care be further potentially impacted? Hagerstown, MD - It was recently reported that Meritus Health is laying off 60 workers and cutting the hours of an additional 43 workers. According to WHAG, Meritus will be terminating the employment of workers through February 15. These cuts are estimated to save Meritus approximately $6 Million. Noticeably absent from the article is any mention if the President, Vice Presidents, Officers, or other key staff have voluntarily reduced their pay, so it is unknown if any senior level paycuts were implemented. By looking at the most recent IRS Form 990 available for Meritus at the Foundation Center, it is revealed that the Presidents', Vice Presidents', and Directors' compensation combined equal a sum greater than $4.2 million dollars in 2011. When combining the compensation of James Hamill, the former President/CEO, with the compensation of Joseph Ross, the current President/CEO, Meritus and related organizations paid to its President a total compensation of $981,711. The total compensation of Vice Presidents, including former Vice President Michael Zampelli, in 2011 was $2,345,731. 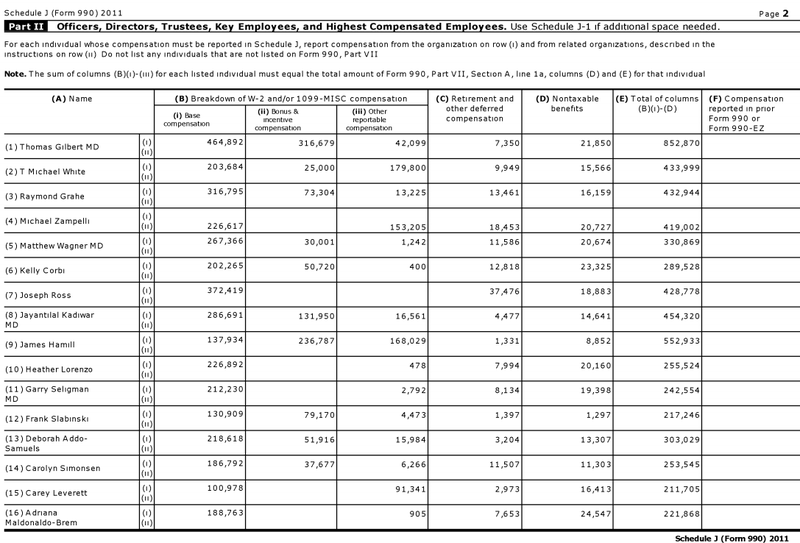 The directors* of Meritus who are paid (not all of the directors are compensated) totals to $958,041. 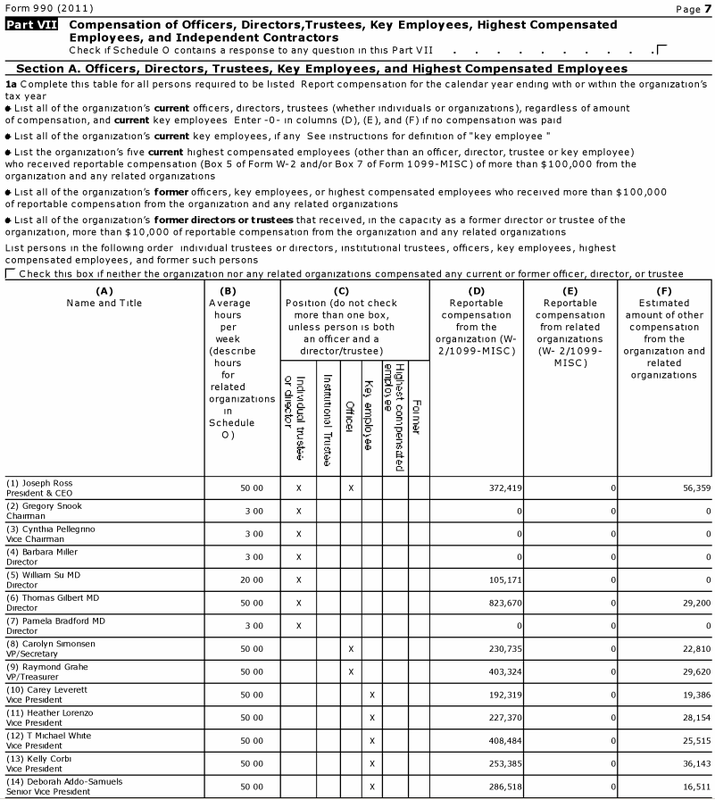 The grand total for Meritus' senior staff who are a President, Vice President, or Director* for 2011 was $4,285,483. Also of interest is that the IRS Form 990 states that in 2011 Meritus employed 152 individuals who were compensated $100,000 or more per year. For anyone who would like to verify these calculations, a spreadsheet outlining the pay of each senior staff member is available here. Original IRS form 990's for Meritus can be accessed below. *Note: Per the Form 990, the salary & benefits that Dr Gilbert received are for his services as a physician & not as a director. Dr Gilbert was compensated a total of $852,870 in 2011.